On this day fifty years ago, C.S.Lewis died. Today, An old Friend of mine, lost his Father. I’ve not seen Peter in many years but have reconnected through social media. I’ve enjoyed watching his successes professionally and with his family, if distantly. In many ways, I think I know him better today than I did those many years ago when we worked together in a San Francisco club. Today, we usually disagree on just about everything when we engage but, at the very least, Peter is always very engaging, responding with timely wit and erudition. If not surprised, at least now I’ve some understanding as to how or why. When Peter disclosed last year that his Father was ill, I recall both feeling anxiety for him and, naturally, thoughts of my own Father and his similar ordeal. Of our Fathers, that is where any similarity ended. As it turns out, Peter’s Father had written a book of memoirs and in Peter’s mentioning them, I was astounded to learn that his Father had been a Monk and his Mother, a Nun. Immediately I was fascinated and just a little envious. Not that my own Father was without a pedigree of a kind but Peter’s revelation instantly made clear how Peter was Peter. Beyond those very unique beginnings, his Father went on to become very active politically and, from what little I know, seemed have led a very rich life. Even that simple understanding or wonder at another’s life and origins has had much more of an impact on me, personally, than John Fitzgerald Kennedy ever did. I was well on my way when JFK was assassinated. I would make my triumphant debut three weeks later at a hospital in California and if at the onset, my disposition true, it would have been loud and fussy. I don’t recall having thought of JFK, one way or another, as a child but I would have been reading C.S Lewis not long into it. Doing so would also have had a more significant impact on me than JFK. One could argue, clearly, that I was certainly, personally effected by JFK, if only by his Presidency and enduring policies. Yet, I can’t say that I’ve ever been influenced in any life’s course by invoking the memory of JFK. The same cannot be said of any author I’ve read or the simple wonder of the uniqueness of the life of a Friend, if hoping to make an impact myself and looking to others for direction and influence. 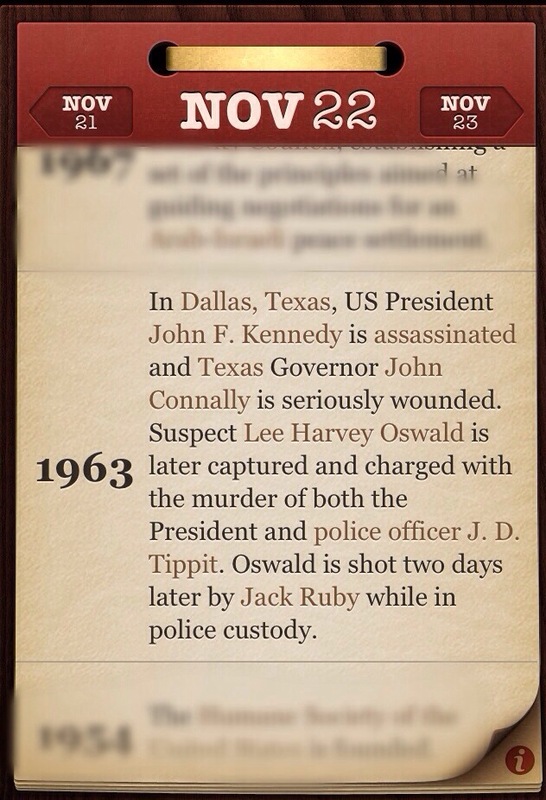 I understand why JFK’s assassination was monumental. I’m not simple. I get that, in many ways, it was to portend the end of innocence, at least in the view of ourselves, for America. I comprehend that JFK and his Family were emerging in a time of great accomplishment and growth, that for many, he was everything they could ever want to be. That he was somehow a representation closer to themselves, Irish, Catholic, plain spoken. I’m not convinced that many of those thinking so had ever visited Cape Cod, Hyannis Port or Martha’s Vineyard. Like my Friend Peter, I think JFK could be determined by his upbringing, surroundings and Family. But with JFK, unlike my Friend Peter, there was Joseph Kennedy and Camelot. Perhaps as they were simpler times, the undeniable facts surrounding The Kennedy’s much troubled history was not as touted. Perhaps the Country was captivated by some inherent longing for a monarchy. Jackie was elegant and graceful, their Children seemed to belong to the Nation and JFK himself was dashing and sophisticated, wealthy and accomplished. What he was also was a notorious womanizer, deceitful both in public and private and nepotistic on a Napoleonic scale. It’s not my intent to disparage him on this fifty year anniversary of his tragic death. I’ve no doubt that, as a leader, he has had some lasting effects on me personally and in some way, made us a better Nation. There was the moon, after all. I suppose when I am unavoidably confronted with this reminder of his death, I usually stop there…at his death. I’d rather think, when having to recall someone for the passing of a particular day on a calendar, on their life, as I do with C.S Lewis or the rich and extraordinary life of Peter’s Father. On this day, the twenty second of November. Godspeed Fr. Paul, we’ll visit again next year.